Look 1 – Bikini photo shoot inside the stone tunnel at Banks Battery. Heavily laden with enough kit to equip a mobile photo studio, we march the dusty path, like many soldiers before us, in searing 30 degree heat. Trekking to the shoot, our destination is the historic Banks Battery fortifications near Rupert’s Valley. Our mission; a bikini photo shoot with model Emma-Jay Constantine, framing her beauty and youth against the magnificent backdrop of the abandoned military lookout point and outlying pebble beach. It takes 35 minutes steady hiking to reach the sea defence wall of Banks Battery, built from cut stone in the late 1600’s. Our backs are drenched with perspiration caused by our backpacks. Darrin’s camera bag weighs 11.5kg, full with the camera, two lenses, four strobes and enough AA batteries to send the Duracell bunny on a round-the-world sprint. I’m carrying two light stands that are awkward to grip, 3.75 litres of water, high heeled shoes, lip gloss and a host of miscellaneous items that might come in handy. Emma’s carting her modelling wardrobe; a variety of tiny bikinis. We take a few minutes to cool down, watch the white surf frothing around the rocks and gaze toward the boats moored in James Bay across the way. But, we are eager to get started so whilst Darrin readies the strobes for the first set, which is mercifully under the cool shade of a stone archway structure, Emma changes into a white crochet bikini and slathers on sun lotion to give her skin an extra sheen. I check her makeup for signs of ‘melting’ but Estee Lauder’s Double Wear hasn’t budged and Emma’s pretty face is immaculate. I applied her makeup two hours before and kept it natural using brown and grey tones for the eyes, brightened the cheeks with a touch of blush and used bronzer to enhance her natural glow. What to wear in 30 degree heat. 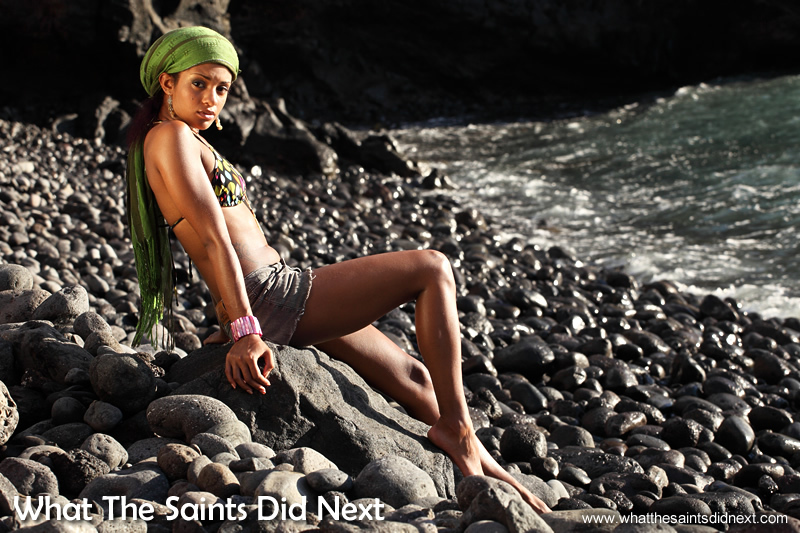 Bikini photo shoot at Banks Battery, St Helena. The Banks stonework provided a great frame for this look. 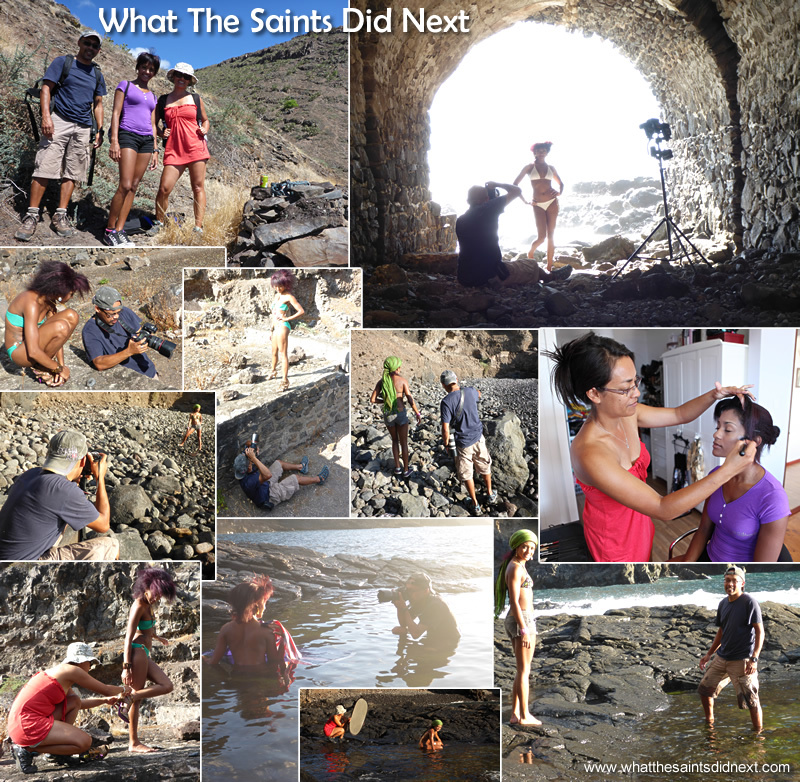 Bikini photo shoot at Banks Battery, St Helena. The first location is amazing. Having worked together before, Emma eases confidently into model-mode. Darrin is shooting through the dark archway tunnel against a glaring sky and ocean backdrop. The four flash heads are mounted on a single light stand, firing directly at Emma to combat the sunlight. The outcome is stunning. The green bikini worked a treat against the rugged terrain. Bikini photo shoot at Banks Battery, St Helena. The stone work was quite painful for this shot. Perfect weather for this shoot. We relocate to the battlements above the archway overlooking the sea. Emma changes into an emerald green bikini and slips on gold strappy heels. I’m capturing behind-the-scenes shots with our Panasonic Lumix and trying not to laugh at Darrin who is contorting his body in an array of unnatural positions to work the angles. This set is all about using the natural hard sunlight. I particularly love the raw appeal and elongated lines of the ‘crawling’ shot. The pose however, is not kind on Emma’s hands and knees so we strategically position smooth stones to make it more comfortable. Look 3 – working the cobblestone battlements. A red tunic is added for the next ‘look’ and we use the patterned cobblestones and a bushy tuft of grass for the backdrop. As Emma moves through a repertoire of poses, I angle a reflector to reduce shadows on her face. Making it look easy in the heat. Behind the scenes on this photo shoot. Conscious of time and light we move to the beach where unfortunately the sea is a little too choppy. The original idea was to shoot in the surf on the pebbled beach, but the growl of hundreds of stones dragging in and out with the waves deters us. From experience on another shoot, this can cause painful bruising on the feet and ankles. Instead, we work as best we can on the beach itself and as the sun starts to dip Emma ‘rocks’ a green scarf and cut-off denim shorts she frayed the night before. Working the pebble beach as the light is already beginning to fade. The sea was a little rough to venture into, but was still a good backdrop. We are quite determined to get an ‘in-the-water’ shot. Darrin scouts the safety of a few rock pools in the area. We get the thumbs up and Emma tentatively wades in holding fast to Darrin’s hand. With inquisitive five finger (pilot) fish nibbling her toes (some people pay good money for this privilege) Emma slowly sinks into the water, although she is wary of breaking waves and jumps each time this happens. Between us we work the angles around the rock pool with camera and reflector and one eye on the swell. The late afternoon sunlight brings a wonderful glow to the shoot. The light and location is perfect but it’s a small window and closing fast. Darrin quickly immerses himself in the pool for close ups, mindful not to get the camera wet. This is the shot of the day. We see the most startling, vivid sunset and Darrin is lucky enough to catch the green flash. Then we hastily pack our gear and scoot back along the coastal path, reaching the car in darkness. Final look of the day with Emma. Great photography, i am proud of you guys…keep rocking. Cheers Louanne, thanks for your comment. Absolutely AWESOME photography! 😀 Job well done guys. Thanks Andrea. It’s always a good feeling when a shoot comes together so well. Wow … your photos are So amazing ….I scroll past work email to get to your mail and blog first …. Keep up the excellent work !! Thanks Julie, much appreciated. Always great having your support. That’s a lovely thing to say about Emma. Beautiful pictures Darin and Sharon. Your model is a natural. Well done. Thanks Noleen. Always helps having such a lovely model to work with. Great work, stunning photos, stunning model, lighting, backdrop. Brilliant. Thanks for the comment Paul, much appreciated. Beautiful !! Emma is so natural n such a beautiful face.. pics were Fantastic. She certainly is a natural in front of the camera, Linda. Very nice person too. Great pictures. Well done Emma, you’re a natural. Beautiful shots………well done again to both of you! Wow! Really professional photography! Awesome shots Darrin, well done to your model, shes beautiful! Thanks Pat, a beautiful model makes any photographer look good, and it was a super location. Really amazing photo’s Victoria Secrets would hire you two any day….wonderful job. How are you? Breeze is amazing, congratulation! Have you eventuallly gone to the US or to UK to start with? Would you be willing to write an article on NapoleonBonaparte, owner of the recently registered brand INVINCIBLE ESPRIT, distributing outisde St Helena the four existing spirits you know well, and owner of the “to be launched” brandy, INVINCIBLE, around the 200 years commemoration taking place in 2015? Alternatively or additionally, include advirtising elements in Breeze and/or other media you may be in connection with? We are husband and wife photographers, Darrin and Sharon Henry, sharing our passion for photography and story-telling. This blog contains tutorials, travel adventures and model shoots, plus our favourite topic, real-people photo-stories. Great to have you visiting us today. Click our picture for more information about us. Get our Breeze e-magazine for free when you follow the blog.